It’s Sunday, June 13, and the 28th Annual Locust Street Festival is ready to tap into fun with an 11:30 a.m. Beer Run. Legendary! They’re off and running at Booth and Locust, chugging along over a 1.8 course with four mandatory beer stops. They pass the “Cosmic Patterns” block where fortunes are forecast, palms read, tarots tossed, and information about holistic health holds court between Fratney and Pierce. The run, it should be noted, is for more than fun. It also helps support the Woodland Pattern Book Center. For those who prefer strolling and browsing, the list of sights is amazing: 60 plus arts and crafts booths, food vendors with temptations, half-a-dozen music stages, and there, at the corner of Locust and Bremen, Milwaukee Public Theatre’s Drum Circle, keeping the Festival beat. 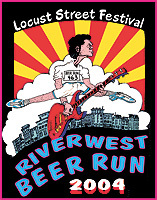 The music stages are each sponsored by a specific Locust Street bar, and Miller Lite and Riverwest’s own Lakefront Brewery also ante-up with music support. or The Tracks at 414/562-2020. Victoria Taylor studies communications at Marquette University. She’s working on a new ‘zine.